Q: When was the first rocket made? A: People in China invented the world's first rockets in the first century A.D. These rockets were filled with an early form of gunpowder that the ancient Chinese named "black powder". When the black powder in the rockets was ignited flaming exhaust gas was generated. It exited from the bottom of the rocket tubes, propelling them into the sky. 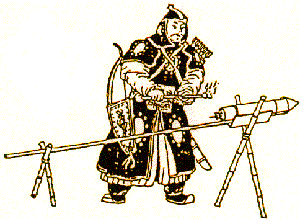 During the 1232 A.D. battle of Kai-Keng the Chinese fought the Mongols with these "arrows of flying fire".